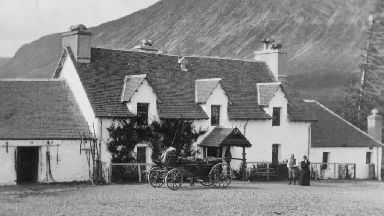 The Kingshouse Hotel near Glencoe was used as barracks following the Battle of Culloden. It's one of Scotland's most historic inns that has served as a base for soldiers, a hub for the local mountain rescue team and more recently a resting place for walkers on the West Highland way. But this weekend, The Kingshouse Hotel will reopen after undergoing a controversial multi-million pound renovation and extension. Situated on Rannoch Moor, at the head of Glen Coe, the inn was once used as barracks for the Duke of Cumberland's troops, hunting Jacobites after the Battle of Culloden in 1746. After parts of the original hotel fell into disrepair, owners Black Corries Estate said they had no choice but to demolish it and invest in a new extension and renovation of the former building. Graeme Ferguson, a spokesman for the Kingshouse Hotel, who managed the redevelopment project, said: "If there hadn't been investment then the hotel wouldn't have been able to continue. "There was a lot of people who had known the Kingshouse for many years, who had built up a real affiliation for it and a love for the building but unfortunately for us it was just unsustainable to maintain it as it was." The design plans for the new hotel building were criticised by a group of outdoor charities. Among them was Mountaineering Scotland who described it as "industrial". Stuart Younie, CEO of Mountaineering Scotland, said: "It's a real shame that more of the original building wasn't kept. "It's at the heart of the climbing community in Glencoe. I think many people would have welcomed the investment while some would have lamented the loss of the authenticity of the old Kingshouse as it was." The new hotel has brought 54 jobs to area and as it will be open all year round, the owners are hopeful it will boost local tourism.